Are you looking to purchase a Conservatory Newcastle? 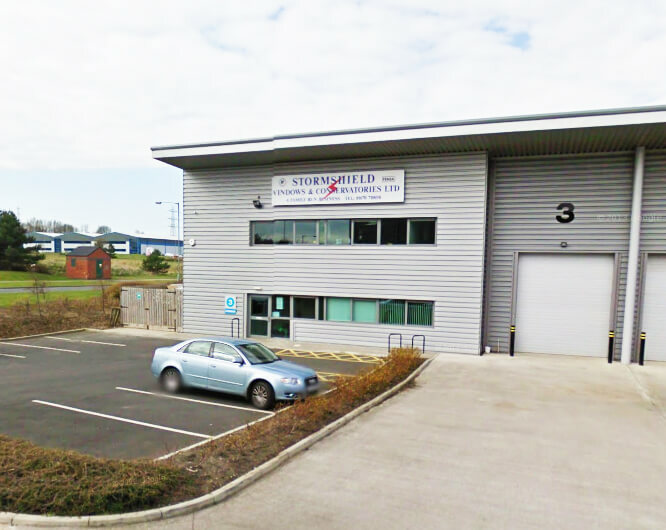 Stormshield was established in the 1980s and over the years we have built our reputation as one of the best installers of high quality, long lasting and stylish conservatories throughout Newcastle and Northumberland. There are many variations of conservatories available with Stormshield. This article aims to discuss the many benefits of conservatories and more information about the services we offer. We aim to provide every customer with a high-quality service and product when completing the work. Conservatories are one of the best additions you can make to a home and we hope that you consider our services for your conservatory. For more information on conservatories please call us today on 01670 710050. Conservatories first came about around the 16th century and were used by wealthy members of society to grow citrus fruits such as oranges and lemons to cater to their more exotic tastes. Conservatories were also used to house tropical plants and flowers for display. Since the increase in global exports, conservatories have now become a great way to add space to homes for extra entertaining or relaxing room and are popular in homes across the world. Adding a conservatory to your home is a great way to increase the value of your home, add space, enhance light flow and provide you with more ways to enjoy your home. We have listed below some of the key benefits of installing a conservatory. To find out more, speak to one of our expert conservatory installers who will be happy to advise you further and help you decide if a Stormshield conservatory is right for you. If you are interested in getting an orangery in Newcastle, visit our Orangery Newcastle page. There are many benefits to having a conservatory installed or upgrading your old one. Firstly, it will raise the economic value of your home and be a brilliant selling point for future buyers if you ever wish to sell your home. A conservatory is a great investment if you’re looking to give your property a touch-up or something unique. It will make any property look more attractive due to the extra living space and the increased amount of natural light that it provides for the room. However, this will also depend on the type of conservatory you choose to go for, so consider your options carefully. 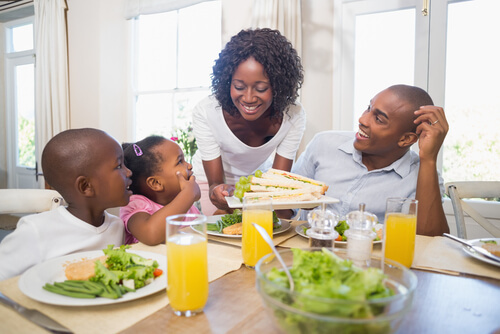 Another benefit of having the extra living space is that it can be used for a variety of different purposes. From a dining room to a fully-fledged bedroom, conservatories can be used for just about anything! It can also simply be used as a gateway to the garden, which is perfect for Spring & Summer. There are endless choices when it comes to your conservatory, and you can even change your mind throughout the year if you wish to swap the rooms in your house around. A new conservatory will also open up your options for events at your home as there will now be more space for guests. If you have opened up the garden area with your conservatory then this will be brilliant for barbecues and social events. It is also commonly known that conservatories can often help people save money on their energy bills. If the right materials and tiles are used it can create an excellent insulation method and provide natural warmth during the colder months. 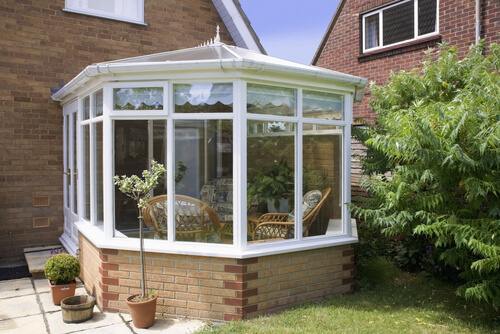 This is one of the most popular types of conservatory as it has a timeless finish. It almost always has an ornate roof. It also incorporates 5 separate panels. The shape creates a more rounded conservatory. This conservatory has a rectangle shape and therefore provides more space for the home. It is a practical choice for homeowners that wish to expand their property. The shape is fairly similar to a Victorian style. The floor shape is of the same shape as the letter P. These types of conservatories are better suited to customers that want a personalised and tailored conservatory. Similar to the Edwardian style, this style also takes on a rectangle shape. Due to the roof shape, it lets in a lot more light than many of its counterparts. This is also a fairly traditional design. Usually, this type is square and has a flat angled roof. If you have limited space at your property then this would be a good choice for your conservatory. When it comes to roofing for your conservatory, you have several options. You could opt for a glass or plastic roof, offering maximum light flow. However, the main issues with these types of roof is that the temperature inside your conservatory will not be well regulated, making it too hot in summer and too cold in winter to be fully enjoyed. 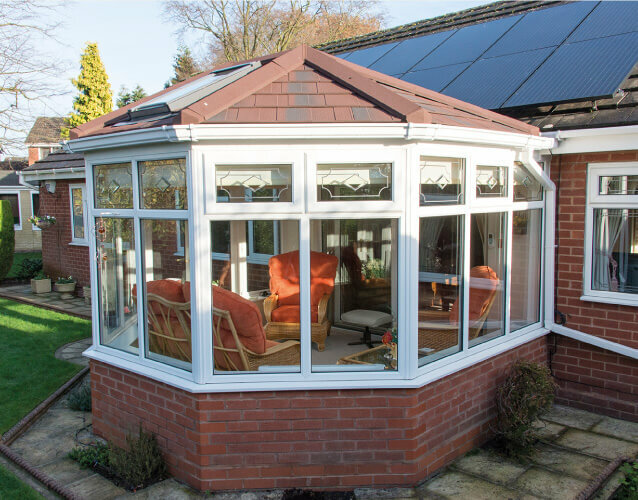 For this reason, we advise choosing a Guardian Roof conservatory, which incorporates a tiled roof with great insulation and ventilation for a conservatory you can enjoy all year round. To find out more about a Guardian Roof in Newcastle, visit our Guardian Roofing page. Many people might be concerned that a glass conservatory will result in a less energy efficient home, but this couldn’t be further from the truth. Modern conservatories come with double glazing, which will improve insulation, cutting down on your heating bills, plus with tilt and turn windows there will also be better ventilation for those hot days. Additionally, the enhanced flow of natural light into your home thanks to a conservatory will mean you won’t need to use your lights as much to brighten your space, saving you money on your electricity bills. Conservatories can be used for a variety of purposes. From extra dining space to an office or study. The possibilities are endless. 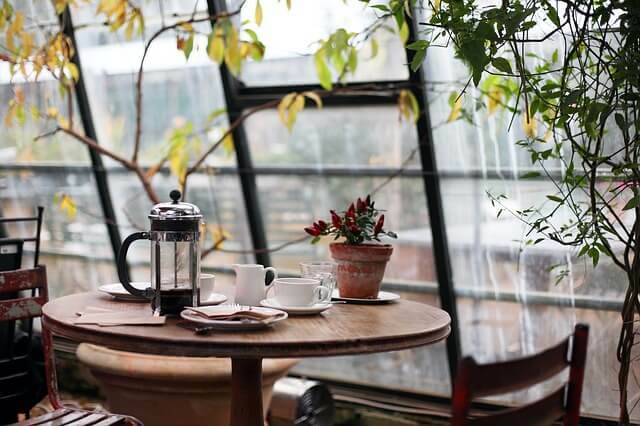 While they are no longer solely used for this purpose, a conservatory is a great place to cultivate and display exotic plants that require a lot of light. Or, how about an extension of your kitchen? A conservatory can help bring added warmth and light to the heart of the home, and provide extra dining space for family meals or gatherings. Homes and Antiques Magazine has put together a helpful list of different uses for a conservatory. And, according to Country Living Magazine, these are some of the ‘quirkiest’ uses for conservatories in the UK. A pop up cinema or indoor swimming pool? Let your imagination run wild with the possibilities. Stormshield is able to provide installation and supply of an enormous range of stunning conservatories, orangeries, windows, doors, kitchens, bathrooms, the Guardian Roof and much more that will improve the look and feel of your beloved home massively and helping you to better enjoy your space as well as adding value to your home. For conservatories, we have so many options available and will tailor your conservatory to suit your needs and requirements. Visit our large showroom to see our range of conservatories for inspiration and to speak to one of our friendly, professional team who can advise you and provide you with a detailed quote. Our trained, expert installers work quickly and efficiently, so you could have your brand new conservatory read to use in no time. Read some of our customers’ reviews and see for yourself what we can do for you. If you would like more information on our Conservatory Newcastle services then please get in touch today!